On Thursday, May 25, 2012 experts chose the site for the largest and most powerful telescope ever built—and it will be in two places at once. The Square Kilometre Array, named for the size of its collecting area, will be 50 times more sensitive than any present telescope and will be located in both South Africa and Australia. It will also be in two times at once, allowing scientists to peer through space into the past. They may learn more about how the first stars and galaxies formed, about dark matter and the nature of gravity. They may find extraterrestrial life. 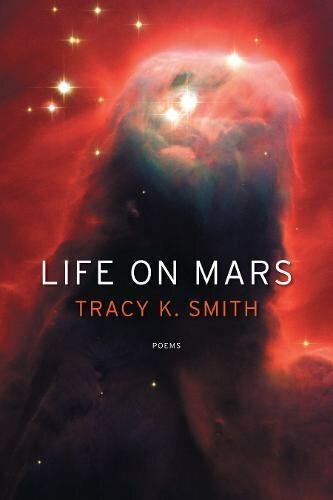 Tracy K. Smith's Pulitzer Prize-winning volume Life on Mars explores some of the same big questions. And like the most sensitive of telescopes, Smith looks powerfully and precisely, scattering her collecting array across the globe and the surrounding space. No wonder: her father was one of the engineers of the Hubble telescope. What Smith finds is radiant, grave, and mysterious, reaching through space like the most powerful telescopes—into the past and future. She gives us visions to set beside the stunning images we're receiving even now from the surface of Mars. The collection revolves around outer space and its kitsch, ranging from references to David Bowie—the title of the book alludes to a song from the 1971 album Hunky Dory—to science-fiction movies from the '60s, '70s, and '80s. Such references, though cultural ephemera, are, under scrutiny, tools for irony, questioning, and critique. One of the best poems of the collection, "My God, It's Full of Stars," considers humans' relationship to the universe via Arthur C. Clarke's 2001: A Space Odyssey, the 1984 film Starman, the 1973 film Soylent Green, and others. The particularities of Smith's gaze allow her to transform the kitsch into fantasies bringing her into imaginative concourse with the unreachable—moon rocks, stars, rock stars, movie stars, and—most important for this collection—her dead father. May I smoke? The outside voices soften. Planes jet past heading off or back. One day from sigh, the shore from which it rose now glacial and stark. These poems get at the particularity of science fiction and its kitsch. (Smith's internal rhyme and assonance present a fine tuning of the ear to that voice.) But their real power lies in the connections they make to the deeper questions. The collection hinges, like this poem, on the question of what we do and don't—or can and can't—know, human limits and mysteries.